So, I’m writing this on the train, heading back from the Page to Stage Festival casting event, which took place in the Baltic Triangle area of Liverpool earlier today [i.e. on Saturday]. This event should mark the start of a more intense period of activity for my play, An Everyday Apocalypse, since, as soon as we have some actors, the whole thing will really be up and running. 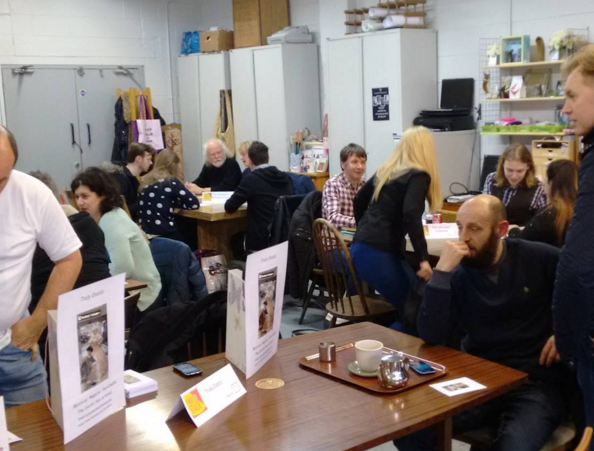 The format of the event was similar to the earlier writers-directors ‘speed dating’ day. Each play had a table, where the writer and director were installed for the afternoon, while a succession of actors strode in to talk to the representatives of whichever productions they thought they might be interested in. However, for me at least, the tone of this event felt very different from that of the earlier directors session*. I had found the rapid-fire pitching of the directors day** pretty daunting. It wasn’t the pitching itself, which is actually quite fun, but more because of the supply and demand aspect of it all. On that day, there were eleven directors and eight writers, a fairly even ratio, so the pressure to make a good impression – to sell yourself and your play effectively – was high. Although all the writers get on well (As far as I can tell! ), the implicit competition for this limited resource and the pressure to pair up with a director that you would be able to work with harmoniously were sources of considerable anxiety (and the subsequent week of back and forth follow-up discussions didn’t help matters much either). Happily, everything worked out well for me, because the director, Zara Brown, and I do seem to be on the same page*** in terms of how the play should be staged, but, beforehand, I really was quite worried about making a bad decision and ending up with someone who didn’t really share my vision for the piece. Yesterday’s casting day was a different sort of challenge entirely (and overall, a much less stressful one). Rather than the hour or so that we’d spent pitching to directors, this was a marathon four-hour stint, with pretty much back-to-back actors’ meetings**** for the first three and a half of those hours. I gave the same pitch almost thirty times in a row, and by the mid-twenties, fatigue was definitely beginning to set in. We saw a lot of good people though; a lot of potential incarnations of our characters, and it started to feel like a real shame that we only had three roles to cast. ***** Of course, a lot of the actors we saw will end up being snapped up by other Page to Stage productions, and I reckon we will be glad of the small cast when we start trying to schedule rehearsals******, but still, it’s a pity that we will end up working with such a small proportion of those who came along. Next stop then, auditions. I’m really quite intrigued to see how these pan out, because I’m pretty much leaving the planning to the director. She definitely knows her stuff, having been through this whole process before at the 2014 festival, so it will be great to see what she has in mind. * I’m using “directors” as an honorary adjective here; it isn’t a possessive, hence the lack of apostrophe. Do your worst, grammar police. ** Here too. You don’t catch me out that easily. *** No. Not a pun. **** This one is a possessive. So there. ****** And when dividing up our estimated tuppence ha’penny of profits.